Swapit is a mobile app that allows to easily buy and sell stuff nearby. Swapit’s core trading platform could be described as a cross-bred service of Craigslist, eBay, Google Maps, and the traditional concept of flea markets. Swapit initially launches in Hong Kong for individual consumers. My name is Patrick Kosiol, I am the co-founder and CEO of S4BB Limited – a mobile app company – which created the swapit app and trading platform. I had been living in China (Kunming, Yunnan) for some years and moved to Hong Kong 2008. Besides S4BB Limited, I am also co-founder of Sky Drone – building civilian drone technology, co-founder of Slate Takes Limited – a boutique video production house, and Director at Skylab Mobilesystems Limited – a location-based services company. 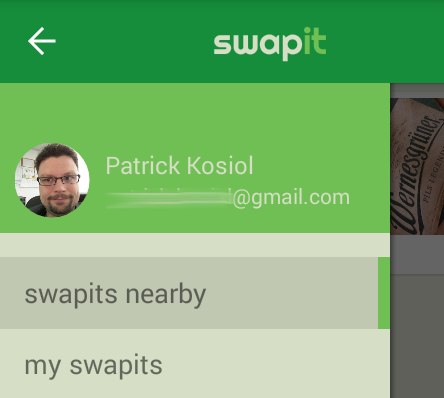 The idea of creating the swapit app came to me when using local buy & sell Facebook groups swap-it-hk and baby-swap-it. That’s also where the name of the swapit app comes from. As I recently became a dad, friends had pointed me to those groups for great deals – especially for baby articles. I bought several items through those Facebook groups like an almost new baby cot, a cute playmat and some other items. Often those items were almost new, but cost half the price or even less of a new one. Besides saving money, reusing such pre-loved items saves the environment and helps the sellers to recover at least some money that they spent for those items before. One of the great features Facebook provides through its groups are notifications. Whenever, a group member posts anything in a Facebook group, all members receive a notification. Unfortunately, that notification is often delayed by several minutes and with hundreds of items being published for sale on such groups every day, it is hard to keep track of new ones and act quickly enough. Because the sale works on the first-come-first-served principle: if you snooze you loose. So immediacy is very important. Similarly to the Facebook groups, swapit had to provide notifications as well, but in a more immediate manner utilizing PUSH notifications to instantaneously alert users of new items and updates. That allows us to maintain the first-come-first-served principle for fast buying and selling of items with a much more immediate approach. When an item is posted in a Facebook group, information about the location of that item is usually mentioned in the description of the post along with a note of whether it’s a pickup-only, meet-up or send-by-post item. Just because swapit is an app that runs on a mobile phone or tablet, it is always aware of its own location and therefore, aware of the location of the seller. Most likely, that is also the location of the item that’s being sold. As a seller it is great to let potential buyers know where you’re located. So in the best case scenario, you can sell an item to your neighbor. While that’s rather unlikely, a location reference on each sale allows buyers to gauge whether that’s a convenient location for them to pick up the item or there is a place nearby to meet and complete the sale. This prevents a lot of unnecessary communication that would be required if the buyer would not know where the item that’s being sold, is located at. Furthermore, the pure fact that each and every item that is posted for sale has a location-reference allows features like sorting items by distance from my location, showing the item or a list of items on a map, getting navigated to a particular item by public transport, car or by foot; and there are a lot more use case we believe the item location can come in handy. Another great thing about such Facebook group posts are their public comments. They allow some sort of public communication while providing information to the general public (i.e. other potential buyers). It is also important to note that the more comments an article has, the more often it is shown on top and therefore, the more likely is being sold quickly. Swapit also provides a comment system in the same way. Combined with our more immediate PUSH notifications the expected time-to-sale should be less than the one through such Facebook groups. If the seller posts an item for sale on one of the Facebook groups and someone who is not his or her ‘friend’ wants to buy it, that person can send the seller a private message to arrange the sale. That’s how it’s usually done. However, because they are not friends that message ends up in the “Other Messages” folder in the recipient’s Facebook messaging center. No notification is delivered to some mobile devices and the communication to actually arrange the sale does not happen as fast as it could. Swapit will allow direct person-to-person messaging utlizing industry-standard PUSH notifications so a message is never missed to complete a sale. Selling items with a mobile phone or tablet can be done a lot easier than with a desktop computer – if it’s done right. Swapit allows to easily take a photo (think built-in camera, photo gallery, etc), enter a title, description and price and publish the item. It can take less than 30 seconds the item you want to sell is listed online and potential buyers nearby are being notified instantaneously. Combined with the location-reference and immediate communication facilities, that sale can be closed quickly. Why are these Facebook groups that inspired our swapit app so successful? I believe their advantages lie in the fact that they are an easy to join group – even though the groups are private and members have to be approved by other members first. The size of such Facebook groups (swap-it-hk: 27,000+ members, baby-swap-it: 6,500+ members) has surpassed a critical mass with enough potential buyers and sellers to create a vivid marketplace. Swapit is being created in collaboration with the founders of those Facebook groups to bring the success of those groups to the mobile world. More about our collaboration efforts will be covered in an upcoming post. We all share the common goal of a more sharing and more environmentally friendly society that tries to avoid unnecessary waste and the reuse of pre-loved items. At the same time swapit helps to recover some costs of items that were purchased before and are still perfectly good to use. This entry was posted in our story and tagged baby-swap-it, background, communication, Facebook, gps, groups, immediacy, location, reference, social, story, swap-it-hk by Patrick Kosiol (swapitla). Bookmark the permalink.